First, there’s the location. Parkshore Resort is right on East Grand Traverse Bay, with hundreds of yards of sugar sand beachfront. Bring all your water toys and let the kids (and your inner child) splash and play to their heart’s content. Cool evenings are made for beach bonfires and there are several fire pits available. Wake up in the morning, with coffee in hand, and meander along the water’s edge…that is simply magical. Now for the resort itself…the number and quality of the amenities are almost overwhelming. 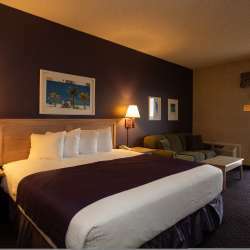 The resort has 80 impeccably-cared-for rooms in a variety of configurations. Whether you’re a business traveler, a family visiting for a week-long vacation, or a couple enjoying an extended weekend, you’ll easily find something to your liking. 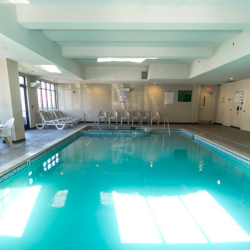 Several suites are available with a whirlpool, which is perfect for relaxing after a long day out in the sun. 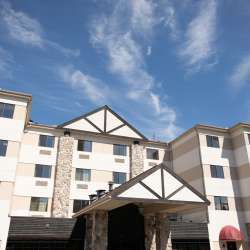 Other welcomed amenities include a cocktail lounge, offering casual dining, a heated pool and spa, guest laundry services, and a full menu for room service.